My life abroad is contained in four panniers, a small backpack, and a bicycle. There’s not much room for unnecessary stuff- simple, just the way I was hoping for. Arguably the thing least applicable to bike touring in my bags are a pair of rock climbing shoes and a harness. This weekend, I realized they might just be the most important thing I brought. Friday I moved my stuff across the city and into an awesome house of expatriates and travelers from around the world, again, fine people brought to me by couchsurfing. My previous host had other plans for the weekend, and after getting to know him I realized he and I have very different views of the world. My last post was somber, and accurately reflected that I was feeling down. He believed that my plan was folly, and didn’t seem to hesitate in voicing his opinions. Richard (who I am now staying with), first responded to my plans by lamenting that he could not join me immediately. 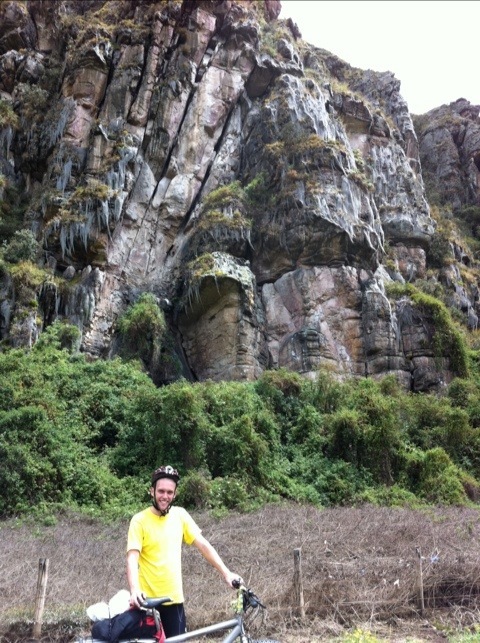 He could however join me for a stellar weekend biking out to a town called Suesca, an idyllic yet touristy center for adventure sports, most notably rock climbing. If the first few days here were spent with the impression that my plans were not possible, Richard spent the next two days showing me exactly how to do just that. We left early Saturday morning and raced out of the city to beat the impending traffic. 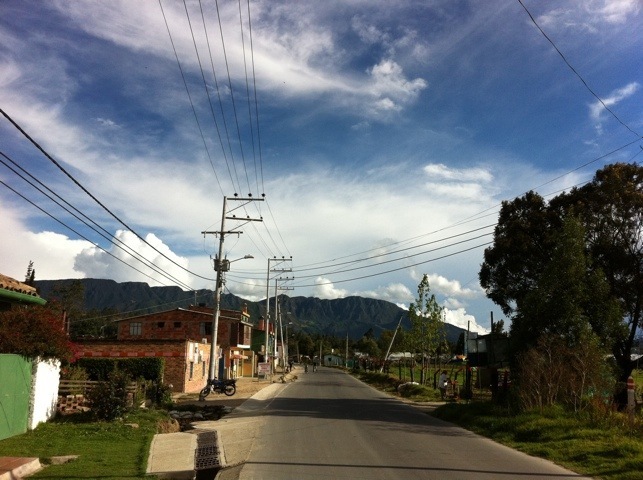 Bogota’s extensive bike lanes saw us rocketing north and onto the main highway by 8am. Like most British kids I know, Richard really only bikes at one speed- breakneck. We followed a surprising stream of other cyclists amidst heavy traffic until the turnoff to Zipaquiera, our breakfast stop and glimpse of small town Colombian culture. Richard’s excellent Spanish landed us steaming tamales and fresh orange juice, and I took very good notes. 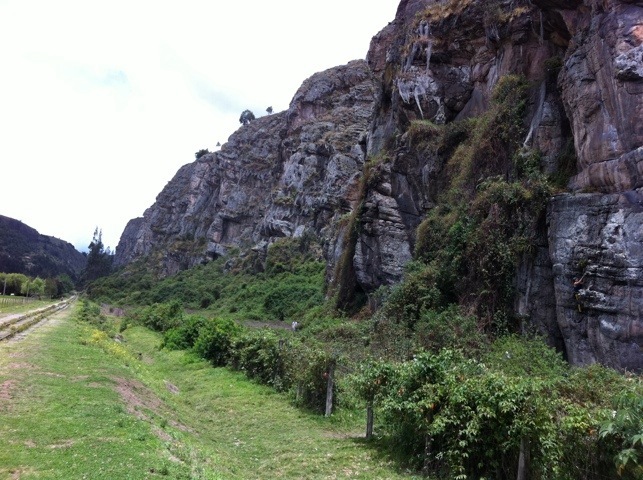 We got to Suesca around 11am and easily found the climbing areas. Accessible, friendly, active, and gorgeous, it was an easy place to be completely happy with. We grabbed a fresh juice and a few hours bouldering, then headed back to town for a hearty lunch (the main meal here). For some unknown reason I spent most of our following siesta wide awake and worried about my plans, I still didn’t believe that I could figure out how to survive and make my way south by bike. 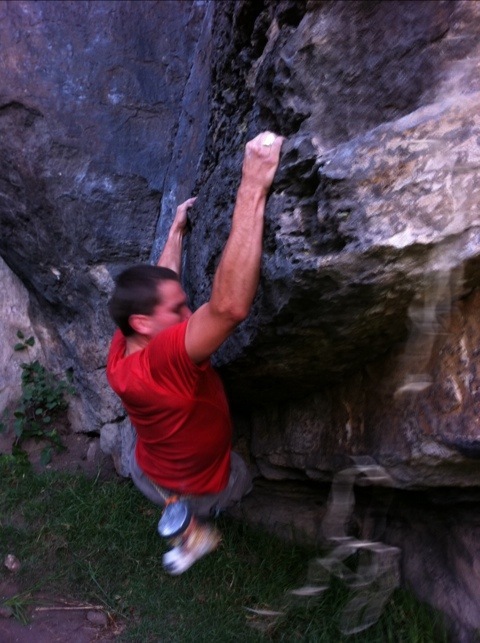 We got up around 4pm and headed back for another bouldering session. I slipped onto my shoes and quickly sent a problem I had struggled with earlier. Our previous session (immediately after 4 hours of biking) had been a little low energy, but with the send this session started to bring back the familiar, and affirming, feelings I have always appreciated from rock climbing. There were more failures, new problems, and harder sends that evening, and we climbed until dark, making new friends and finding new treasures in each nook of rock. We headed back to town for a substantial dinner and catching up with some of the folks we met on the cliff. I shared photos from my blog, we swapped English/Spanish climbing words, and enjoyed a lightning storm across the valley. I couldn’t imagine a better Saturday night. 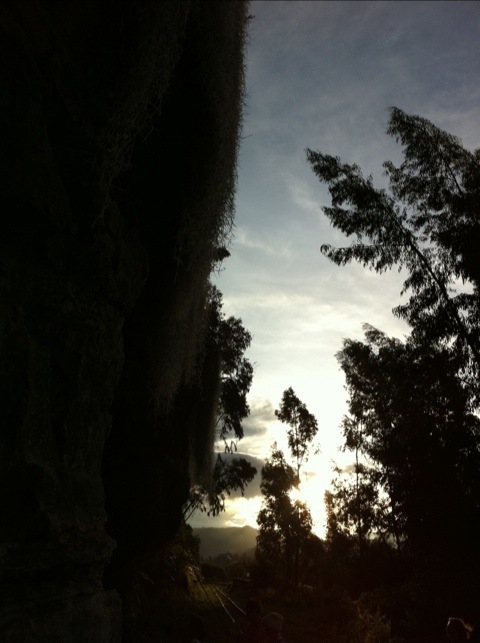 Sunday we were up early, grabbed a hearty breakfast, and found even more new bouldering terrain. My energy came back quickly and moving over stone I felt powerful and happy. 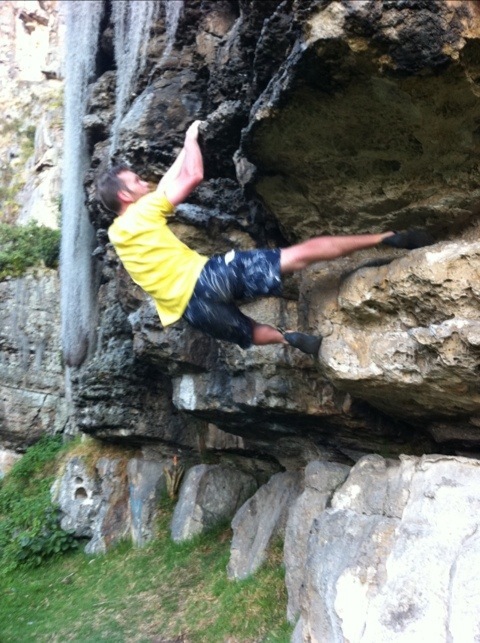 We found a few friends who offered us their rope, and after the bouldering already done, I took the sharp end and put the draws up on a 5.10c. It was steep and runout, but I had a blast and it only furthered the local friendships we had already started to form. We said our goodbyes around 130, ate, packed, and headed back to the city. A more direct route brought us home in about 3h15m, and we quickly bought heavy rations for tuna-mac. The moral of the story- the least important thing on my bike isn’t my rock gear, it’s the doubt in my head. It’s one thing I’m very glad to leave on the ground as I climb through this new experience. I’m sure it will be a continuing battle, but one that I believe I can win. Many thanks to Richard for a great weekend, and so many possibilities. 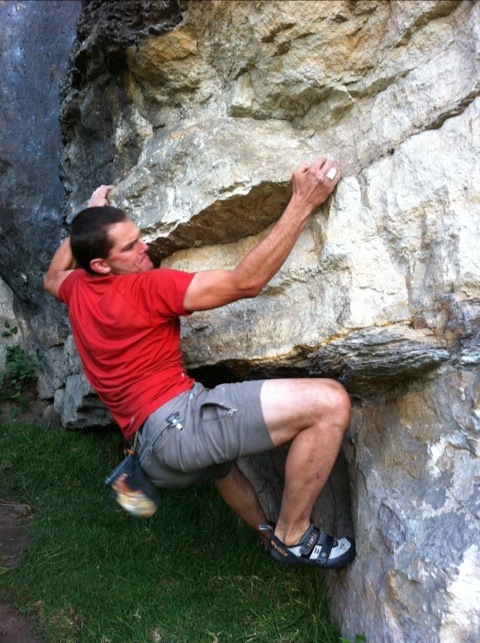 This entry was posted in Rock Climbing, Traveling on September 25, 2011 by sticker1. I am loving your entries and admire what you’re up to. I hope you find a way to unload the doubt. Seems like you’re on the right track. Stay positive! Thanks so much for following, I’m going to start actually biking tomorrow and I’m feeling great. Another post is coming out tonight before I lose internet for a bit. Keep in touch, I’m psyched about what you are up to as well!